On Wednesday, GOP House members will elect their 2016 speaker. Corcoran and others have a ‘manifesto’ in which they promise reform. The Republican from Pasco County promises big changes to legislative process. He is far from being a household name in Florida and yet he will command one of the three most powerful positions in state government with the ability to control every piece of legislation — from how much money goes to public schools to whether the working poor have access to affordable health care. Rep. Richard Corcoran, from Land O’Lakes in Pasco County, will be designated speaker of the Florida House on Wednesday for the two-year term beginning in November 2016. He will be formally elected by his GOP peers to a job that comes with prestige and enormous power over the 120-member chamber dominated by Republicans. Behind the governor, only one other person has as much clout as the House speaker.But that job, Senate president, is being bitterly contested by Republicans Joe Negron of Stuart and Jack Latvala of Clearwater and may not be settled until after the 2016 election. As a former legislative aide and legal adviser to three former speakers and Gov. Rick Scott, Corcoran brings with him more than 25 years of legislative experience, a network of loyalists,an allegiance with the governor, and an agenda determined to shake up what he considers the “corrupting” influences of Tallahassee. Working behind the scenes since he won enough pledges to be named speaker of his incoming class in 2010, Corcoran and the 28 members of his class have developed a white paper he calls “The Manifesto.” In it, they outline a plan to blow up the top-down process of House leadership that has allowed special interests to drive a wedge between lawmakers. Rep. Richard Coccoran, R-Land O’Lakes, speaks about the House budget concerning health care during a legislative session, Wednesday, April 1, 2015, in Tallahassee. His goal, he says, is to dismantle the lobbyist-influenced hierarchy of legislative leadership by delegating and sharing power with members in a way that “gives all legislators equal footing,” empowers committee chairs to set the agenda, and tasks legislators with the responsibility of pushing their initiatives. Corcoran was a deputy staffer in the office of former Speaker Dan Webster the last time the House process was reformed to increase the role of members and reduce the clout of outside interests. But Webster, now a congressman from Winter Garden, warns “it’s very difficult,” and when he did it Republicans were not used to being in power as they are today. Like Webster, Corcoran is ideologically conservative, but he was elected to office in a tea party wave that has divided his party and the GOP-controlled Legislature. Whether he can succeed in reforming the process while adhering to his principles is an open question. Corcoran, 50, has been preparing for this job for nearly three decades. He graduated from St. Leo University in Pasco County in 1989 and went to work for former Rep. John Renke, a Republican from New Port Richey who was destined to be minority leader of the House when he was defeated. He returned as a legislative aide for his long-time friend, Paul Hawkes, and spent time running Mike Fasano’s 1994 House campaign. He earned his law degree at Pat Robertson’s Regent University and in 1996 started working for Webster. In 1998, Corcoran ran and lost his first House race to Nancy Argenziano, then served as outside counsel for former House Speaker Tom Feeney in 2002, and returned as chief of staff to former House Speaker Marco Rubio in 2006. Rather than stay in that job, however, Corcoran took a risk. Counting on Argenziano, then a state senator, to be appointed to the Public Service Commission, he left his $175,000 a year job as Rubio’s chief of staff to prepare for a state Senate campaign. He ultimately dropped out rather than face Rep. Charlie Dean, a former Citrus County sheriff. Corcoran kept his hand in politics, consulting and running a Crystal River mail service company, when he was hired by Scott to do legal work for Solantic, Scott’s chain of health care clinics. In 2010, while campaigning for his House race, Corcoran won enough pledges to become designated as House speaker by defeating Reps. Matt Gaetz, R-Shalimar, and Ben Albritton, R-Wauchula. In his speech to the Republican caucus Wednesday, Corcoran will outline his plans to “flatten” the power pyramid. In an affront to the insiders who capitalize on access to the appropriations suite, Corcoran’s manifesto calls for bringing transparency to the shadowy budget process. As chairman of the House Appropriations Committee, he began requiring all members to put their name on every project they requested this year, but the process fell apart in the final budget negotiations with the Senate. Corcoran also wants to end the process that allows each class of freshmen representatives to pledge support for a House speaker years before they have been tested — the very same process he used to win his title. And, buoyed by his close friendship with Rep. Jose Oliva, R-Miami Lakes, who is designed to succeed him in 2018 as House speaker, Corcoran is determined to have his reforms remain in place after he leaves and to shame Republicans in the Senate to follow suit. “When you lead by example and you have your facts in order, people tend to be willing to follow,” Oliva said. Presiding officers in the Florida Legislature are elected by a democratic vote but they operate with autocratic authority, executing control over nearly all aspects of legislative life — from parking places and staff salaries, to which bills get heard and when. Different presiding officers have different styles but the process allows them to completely control the agenda, and the outcome — if they choose. “The pyramid of power is so sharp that the rank and file members can’t even get close to it. They are ignored. They are threatened — not directly but indirectly,” said Fasano, who spent 19 years in the Legislature, most recently in the House, before being appointed Pasco County Tax Collector by Scott. Fasano. who was in the House in 1996 when Webster was elected as the first Republican speaker in 100 years, recalled how Webster “empowered every member.” He allowed committee chairs to set the agenda and everyone — even low-ranking Democrats — to get a bill up for a floor vote, Fasano said. “If Richard Corcoran is able to do what Dan Webster did by flattening the pyramid of power, then God bless him because he’ll be successful,” he said. “It worked,” Webster recalled last week. “Nobody in the Capitol could believe it” when he and then-Senate President Toni Jennings adjourned at 6 p.m. with all the important work done. Lobbyists applauded and then-Gov. Lawton Chiles greeted them “with napkins over his arm” as they drank orange juice in the Capitol rotunda. Fasano warned that declaring war on special interest turf battles in the era of big money politics will also be challenging for Corcoran, whose brother Michael is among the top lobbyists in Tallahassee. “What is Richard doing right now?” Fasano asked last week. “He’s raising money, millions of dollars” from corporations and their lobbyists. 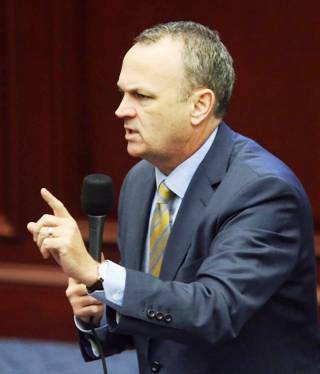 As head of the election effort for House Republicans in 2016, Corcoran acknowledged that he is raising millions, mostly through the Republican Party of Florida. But he and his team of loyalists deny campaign cash will play a role in the House’s agenda. Latvala who accused House members of following leaders “like lemmings” when they ended session three days early in disagreement over health care funding, also warns of Corcoran’s “rigid ideology” and refusal to compromise.